It was Iris Murdoch in a 1989 Channel 4 interview who described the novel as ‘a marvellous art form, a free country . . . you can do absolutely anything there.’ Both Peter Childs’ Contemporary Novelists and Zachary Leader’s On Modern British Fiction ultimately endorse Murdoch’s view, though they take vastly different approaches to arrive there. Zachary Leader, as editor of On Modern British Fiction, has brought together essays by a number of novelists, critics and academics, to whom he has given free rein to write about ‘modern British fiction.’ Valentine Cunningham in his piece ‘Shaping Modern Fiction’, while also paying tribute to Irish Murdoch, reminds us how numerous were the first fictional models that kick-started the form into being: Bunyan’s puritan biography method; Defoe’s diary-puritan autobiography-personal testimony mode; Swift’s autobiography-travelogue-utopian story combo; Richardson’s epistolary model; Fielding’s picaresque ‘Cervantick’ comic-epic in prose; this listing parodying the novel as mock encyclopaedia itself. And so on. Experimentation in form has never stopped. Later, for Joyce, it was a question of ‘order in every way appropriate’; for Henry James, Joseph Conrad and Virginia Woolf, it was the ‘modernist plots of epistemological hesitation, refusal and general unknowing’; and for Murdoch herself it was storytelling, in parts comic storytelling, in the great tradition of the 19th century novel. Cunningham informs us: ‘you can, it is clear, do the novel, the serious novel (what literary prize arrangers and the posh newspapers know as ‘literary’ fiction) in almost any way that comes to mind, or, to go on using the Joycean term, what seems appropriate to you. The novel can indeed be allegory, or essay, or fairy story, or cartography, or SciFi, or Crime Story, or anatomy textbook, or retro-Gothic. The formal field could not be more open.’ Writing carefully without any overt value judgements, Cunningham does however spare a few thoughts for those who had to battle with the ‘anarchic’ or ‘liberationist’ novel, as typified by B.S. Johnson’s The Unfortunates. This kind of work consisted of ‘loose sections, bits of text in a box, which readers were supposed to read in any order they chose.’ Here, Cunningham’s thoughts are less with the reader than with the too-easily upset public librarians who ‘hated this practical manifesto against the ‘clapped out’ connected linear narration – for obvious reasons: bits kept getting appropriated or lost by readers.’ Point reluctantly taken. Leader’s collection of essays began life as spoken texts, first delivered at a conference entitled ‘The Novel in Britain, 1950-2000′ at the Huntingdon Library in San Marino, California. The book, which also contains some other material not given at Huntingdon, mixes novelists, critics, and academics with reviewers, a publisher and an editor, and so cannot qualify as yet another academic volume designed to cast more obscurity on the subject. It is quite the opposite: it is a lively and highly readable set of thoughts about ‘modern British fiction’ and all that ‘modern British fiction’ may be said to constitute. The editor makes clear at the outset that in commissioning these papers (for conference and book) he ‘specified broad topics – tradition, nationality, genre, the market’ and asked contributors ‘to produce what they considered important or suggestive instances and examples rather than to survey the field.’ The result is a collection of essays that are different in tone, register, methodology, and length, but each an engrossing discussion of the subject. I cannot imagine for a second that Leader was disappointed with the outcome. 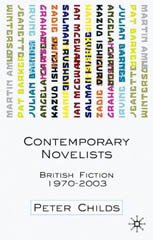 From among the novelists come essays from: Martin Amis, writing fondly about Mr and Mrs Iris Murdoch; Ian McEwan remembering his mother; and Hilary Mantel wondering about nationality and ‘the writer at home in Europe.’ From the critics and academics come essays on ScFi, P.D. James, and even ‘ladlit.’ What Liam McIlvanney writes in his chapter on ‘the politics of narrative in the post-war Scottish novel’ does manifestly obtain where Gray and Kelman are concerned, but I am not sure how Muriel Spark qualifies as a Scottish novelist. A British Catholic novelist and moralist, most certainly; a Scottish novelist, I am not sure. There are two particular gems in this collection: essays from editors, one from Lindsay Duguid, fiction editor of the TLS, and the other from Dan Franklin of Jonathan Cape. Zachary Leader is to be congratulated for allowing these two wolves into the hen-house. As it happens, it was a case of mistaken identity, for these wolves (in the story) turn out to be lambs, and very sweet ones at that. Two words about the title: ‘modern’, while always problematic in itself, signifies here post-1950, and ‘British’, even more problematic, signifies, well, the contributors themselves cannot quite make up their minds, jointly or severally. And that is one of the many attractions of this book, which does not offer any ‘single approach or overarching theory.’ Read it and enjoy it as a pure celebration of the art form. Peter Childs’ Contemporary Novelists – British Fiction since 1970 is a different kind of work to Leader’s. As its title suggests, it is a survey, and explores the major work of twelve of the most widely studied British novelists of the last thirty years. As such it is a text primarily aimed at the university student, and for that audience it will be a particularly useful teaching resource and reference work. 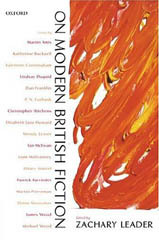 In his introduction, ‘The Novel Today and Yesterday’, alongside a discussion of the political, wider literary and critical backgrounds, Childs places contemporary fiction firmly into a recognisable context, first looking at the list of the Book Marketing Council’s ‘Best Twenty Young British Novelists’ of 1983. (It must be most gratifying for the BMC to know that at least seventy-five percent of their Best still earn their living from writing novels). Interestingly, from the Granta ‘Top Twenty’ list of 1993 a little more than fifty per-cent of their ‘Tops’ have remained true to novel-writing. From the Granta ‘Top Twenty’ list of 2003, we will have to wait and see who is to do what over the next ten years or so. Childs’ dozen novelists ‘represent a cross-section of the most prominent writers born since the beginning of the Second World War’ and he concentrates solely on British authors. These are: Martin Amis, Pat Barker, Julian Barnes, Angela Carter, Kazuo Ishiguro, Hanif Kureishi, Ian McEwan, Salman Rushdie, Zadie Smith, Graham Swift, Irvine Welsh and Jeanette Winterson, who constitute ‘for the most part the Granta list generation.’ Given the intended readership of his volume, the novelists Childs selects ‘are those most often encountered on contemporary fiction courses.’ While perhaps only one or two of Childs’ writers will ever be considered to be major, they are all well-established and have each received a good deal of critical attention and are regarded as prominent contemporary writers.